Adding a little cocoa to your child's cup of milk or sprinkling a little bit on a piece of fruit may encourage your child to eat healthy foods he may not want to eat. Chocolate can be part of a healthy and balanced. Chocolate, specifically dark chocolate, has become a hot topic recently as studies are showing some health benefits. However, even dark chocolate can be high in calories, so children -- and adults! -- should consume it in moderation. The University of Michigan Health System explains that dark chocolate may have beneficial effects on heart health by lowering blood pressure, reducing LDL cholesterol and maintaining healthy blood vessels. Chocolate contains flavonoids that have been shown to improve cardiovascular health. These benefits affect children the same as they do adults, although most studies are performed using adults. The ancient Mayans and Aztecs used cocoa for many medicinal purposes, including constipation and diarrhea. Recent studies involving children have shown that chocolate may be beneficial in preventing these two conditions. A study in the journal "Pediatrics" found that children given cocoa husk, which is very high in fiber, were more likely to be relieved of constipation than those given placebo. The amount of fiber in the husk may be the cause of the result, not the amount of cocoa. Another study in "The Journal of Pediatrics" showed that the flavonoids in cocoa limit the release of fluids that cause diarrhea. Diarrhea can lead to dehydration, a serious health problem for small children. A dark chocolate candy bar contains about the same amount of caffeine as a 12 oz cola drink, or about 30 mg. Caffeine is a drug that stimulates the central nervous system and can lead to sleeplessness, headaches, nervousness, upset stomach and other symptoms. The United States doesn't have a recommendation for the amount of caffeine that is safe for children; however, limiting the amount of caffeine you give your child is wise. 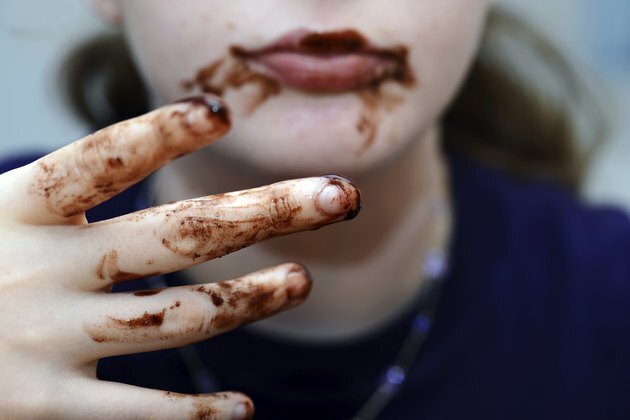 The health benefits of chocolate are found in cocoa, which is bitter, and most children wouldn't eat it. To make it more palatable, fat and sugar is added which increases the calories and decreases the health benefits. Childhood obesity is a serious concern in the United States. Dark chocolate can be part of a healthy diet for your child if you allow her to consume it in small portions as a special treat on occasion. Choose dark chocolate with at least 65 percent cocoa for a healthier choice.